How sedentary is too sedentary? I agree with the article that people with chronic ailments that limit their ability to be active should do the best they can. I do water therapy three days a week and a non-impact glider for 15 minutes three other days a week, yet I can't walk more than one to two city blocks without rest. One thing I do is get up periodically, like after I finish paging through a section of the newspaper, I get off the couch and put the section on the kitchen table before starting the next section. I also do stretches while watching TV or reading. One thing I wonder about, though: is anyone taking into account the diet of those who are sedentary? Because there is a big difference between someone who works out but still eats junk and someone who is sedentary due to illness but eats healthy foods in controlled portions. I am far more sedentary than a healthy person because I am partially housebound, but I am not obese and have a healthy heart, blood pressure and cholesterol due to my vigilance about proper diet. P.S. I made a New Year's resolution to eliminate all desserts (except crustless pumpkin pie and dark chocolate) to see if I can get rid of the 10 pounds I gained after my thyroid medication was changed, and so far, I've kept it the resolution. Do happy people make their bodies happy too? Does a positive attitude help when your chronic illness becomes worse? I believe in realistic optimism. I think it is important to acknowledge anger, sadness and other negative emotions in order to release them from your system and thus make more room for creating happiness in your life. It would be abnormal for someone with chronic pain or other life-altering impairment to not have the occasional down day. It is when we become stuck in the destructive or counter-productive emotions that we do unnecessary damage to ourselves and should seek reliable assistance such as the services of a licensed clinical psychologist. Even a dying person can find joy in the time that is left. I choose to laugh and to do as many positive things as my ailments will allow. I believe my condition would be far worse if I did not. Thought I would NEVER finish editing the rest of my vacation pix! But at last, the deed is done, and I am ready to conclude the tale of the Great Disney Adventure 2009. Got up the the morning of November 13 at a reasonable hour as we were to spend the day at the Magic Kingdom, and the park opened at 9am. But it was difficult to figure out what to wear as the previous day had only been about 40 degrees and the normal high is probably 30 degrees warmer. Settled on a tank and shorts with a hoodie, but when we left our room, as soon as we got around the corner, a chilly wind hit me, and I had to go back and change into some pants. We caught the shuttle about 9am I think. Since it was a Friday, the park was somewhat crowded, but not awful. Dan's parents each rented a scooter since there would be more walking involved than they could handle, and Dan pushed my wheelchair. Since I had only been to the Magic Kingdom once before, in 1989, I had the camera at the ready. I was pleased to see the park all decked out for the holidays. Due to my limited energy, I had already picked out the attractions Dan and I most wanted to see and had a custom map of the park printed out, and Dan's parents said they'd just go wherever we did. We went straight through Main Street, where they had a little parade featuring a horse-drawn trolley, and veered left toward the Pirates of the Caribbean ride. Naturally, I was interested in how they had updated it since the movies came out. They had actually fashioned an animatronic Captain Jack Sparrow after Johnny Depp, which was cool. Just like when I had gone to Epcot Center in 2007, most of the rides either had special lines or access for wheelchairs and some even for scooters. They would let me board a ride and would have my wheelchair waiting for me when it was over. I was grateful not to have to use up all my energy waiting in lines. After we got done vicariously living a pirate's life, heh heh, Dan's dad suggested we check out the jungle cruise which was right next door. It hadn't been on my list, but I was willing to give it a whirl. It is a boat tour with hilarious narration through various parts of the world. Then we crossed over to Liberty Square. I had wanted to do the riverboat ride, but we got there just as they were taking off, and the next one wasn't for quite a while, so we went to the Hall of Presidents. It is a theatre-type presentation featuring, what else, U.S. Presidents. They had updated it to include Obama taking the oath of office, which I enjoyed. 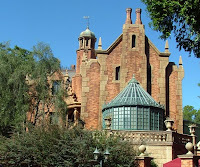 By the time we got back the riverboat, we had missed it AGAIN, so I just gave up on it and focused on one of Dan's requests, the haunted mansion. This was the only one without a special line, and the park was getting more crowded by this time, so we waited probably 45 minutes to get in. I hadn't seen this one since I was 10 years old in Disney Land and had been quite frightened by it, but I liked it a lot more this time. It was definitely lunch time once we were done being haunted. Dan's parents wanted fried chicken, so they went to a quick service place, but it was bursting at the seams with people, and I didn't feel comfortable trying to find a manager there to figure out if they had something I could eat, so Dan was kind enough to take me to another place that was still crowded but not nearly as chaotic. We were easily able to flag down an employee who could bring out a chef to talk to me, and he kindly whipped up some gluten free mac and cheese for me, which I had with some apple slices. Fueled by lunch and some iced tea, I was ready to take on some more attractions. We went to Mickey's PhilharMagic 3D Spectacular, a short-ish 3D movie. In it, Donald Duck steals Mickey's wizard hat (from the movie "Fantasia"), and mayhem ensues, fun for everyone. After we got out, we were at my fave part of the park, the carousel, and I wanted to take a lot of pix of it and the castle and some other stuff, but I was afraid Dan's parents would get bored, so we split up for awhile. The in-laws went to the front of the castle to watch a parade, and Dan and I wandered around with the camera. 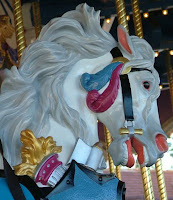 Magic Kingdom's carousel has all white horses, each quite detailed, and I got some nice shots despite the crowds. When we got to my fave ride in the park, the Mad Tea Party, Dan surprised me by volunteering to go on it with me. I laughed hysterically as we spun crazily in circles, but Dan lived to regret it, heh heh. I don't think his stomach calmed down for a few hours. Dan and I returned to the front of the castle as soon as the parade ended and met up with his parents again. We proceeded to the Monsters Inc. Laugh Floor, a new-ish interactive performance similar to the Finding Nemo one in Epcot Center. They kept putting the cameras on members of the audience and putting them on a screen with funny captions; they showed Dan with words "can't resist the urge to dance", and he got out of his seat and started dancing, which was hysterical. No visit to Magic Kingdom would be complete without the classic Carousel of Progress. It's a tribute to technology put together in the 1960's originally, corny but well-intentioned. Their update in the last portion featured computers, but even that seemed dated considering the smart phones and social networking and other very recent inventions. With that, we had completed my to-do list. We had reservations at Tony's Restaurant near the entrance for 6pm, but it was only 4:30, so we decided to check out the shops to kill time. Had not intended to purchase anything, but I found a very nice porcelain snowflake-shaped Christmas ornament with Mickey and Minnie on it, still breakable but not as fragile as the stuff I had seen the previous day. I tired of the shops quicker than everyone else, mainly because the other shoppers kept running into my wheelchair, so I decided to wait out front of a certain store near the restaurant. Turns out I had picked out just the right spot on the curb to get a front row seat to a parade that I didn't even know was going to happen. It featured performers on stilts and floats shaped like enormous holiday gifts carrying various Disney characters. The sun set shortly after the parade, and it was kinda cool to see Main Street all lit up. When everyone was done shopping, we headed for Tony's, which is an Italian place based on the one in "Lady and the Tramp". While we waited for our table, they played the movie on a screen near the entrance; amazing, fifty years after it was released and with much more sophisticated animation in use now, that the kids in the restaurant still flocked to and were mesmerized by it. Our table was near a fountain with a statue of Lady and the Tramp in the center, and someone had put Santa hats on the dogs, heh heh. Since we had made the reservations months before, the staff was ready to accommodate my diet. I got to have gluten free spaghetti and meatballs, first time I had ever been able to order such a thing in a restaurant. Normally, there would be a night time parade to watch, but they were having a special holiday party which was quite expensive, so we headed for the exit once dinner was done. Probably just as well as I was practically comatose from exhaustion anyway. I kept dozing off on the bus ride back to the hotel and was annoyed every time a bump woke me up. Back at the hotel, we inquired about checking our bags through the hotel in the morning instead of having to haul them to the airline's check in desk. After some long drawn out process that I was too tired to understand, we were told to have our suitcases ready at the front of the hotel at 9am and be ready to catch the shuttle at 11am for our afternoon flight. Why so early, I don't know, but I was too grateful at having my suitcase taken care of to argue. Back at the room, I somehow managed to shower and then fought the brain fog to figure out what could be packed away that night and what I would still need in the morning that couldn't go in my carry-on. Went to bed as soon as it was safe to do so, about 11pm I think. One last night being kept awake by snoring despite wearing an ear plug. Finally started some real sleep in the wee hours of the morning only to awaken to the sounds of debate about how soon we could get the suitcases downstairs. It was only 7:30, so everyone had to wait for me to complete my morning rituals and get packed up. I hate having so much to do before I can function for the day. After the suitcases were on their merry way, we had two hours to kill before the shuttle would be picking us up, so Dan and I perused the grounds of the hotel with camera in hand. Each building was named after a Disney movie and had statues from that movie decorating it. The themes were Fantasia, 101 Dalmations, Toy Story, and the Love Bug. I took pix until my batteries ran out, and then we went to the food court. I had some fresh fruit and some hot tea. Around 10:30, we grabbed our carry-on stuff from the room and checked out and then waited around for the shuttle. We got to the airport with two more hours to wait for our flight. Dan wanted to check out the shops, so I wandered around with him. After about an hour, we decided to head to the gate. The security lines weren't very long, but it seemed just about everyone required special screening, so it took wayyyyy longer than we had anticipated. We got to our gate right as it started boarding, about 45 minutes before we were to take off. But there was still time to get the wheelchair properly labeled and stowed without any hassle. Dan and I were sitting across the aisle this time, and it was too noisy and crowded to say much to each other, so I picked up my book and buried my nose in it. Dan and his parents were all sound asleep within minutes after we took off. I envied them, because I was in too much pain from those awful airline seats to get any rest. We got to Atlanta on time with no problems. We had a three hour layover before we headed to Sioux Falls, and I really needed to eat something more substantial than soy crackers, but the only place I could find that had food even remotely safe for me was a mini Chili's. My choices were salmon or a hamburger patty, so I chose the salmon, and the only side dish was broccoli, which is difficult to digest, so I only ate a few small bites of it. While we were waiting for our flight, we were informed that the plane was a considerable hike from the gate involving multiple flights of stairs, so I had to get to the tarmac via elevator and seemingly miles of plastic covered asphalt before we reached the steps on the plane itself, which I was able to climb, albeit verrrry slowly as I was in massive pain. I was again the last one to board. This being the plane to Sioux Falls, it was rather tiny, and I had trouble contorting myself to get in the seat. Dan again was able to doze off, but I was having back spasms so bad that I went into the lavatory and cried. I tried to concentrate on reading my book, but between the turbulence and a rather large man behind me constantly smacking my seat, I didn't accomplish much. We got to Sioux Falls about 10pm, not a moment too soon. Quite a shock, that frigid Sioux Falls wind in our faces as we waited for my wheelchair. Luckily, I had thrown a jacket into Dan's carry on, and there was a hat and gloves in the pockets. I put these on while waiting in baggage claim. So, in conclusion, the trip was awesome, but I was in a really nasty flare for five weeks afterward, so I will have to carefully consider any future travel. But I have sweet memories, hundreds of cool pix, and my sense of adventure satisfied for the time being. My church, while not Catholic, does communion regularly. They use actual bread that is dipped into a communal cup, so I can not safely use either. Rather than having them use special bread and a separate cup, I opt to have a blessing instead, which is what they routinely give to young children as well. So is XMRV indicative of CFIDS or not? Was hibernating upstairs last weekend while the temperature dropped to 30 below zero! Have been distracted this week by bad news, but do intend to finish editing November vacation pix and posting about them soon.